I am not sure what is worse, a Blezow best bet or an SI Cover. Favre was put on the cover just a week ago after the Seattle win. Groan. Cringe. With friends like these, who needs enemies? 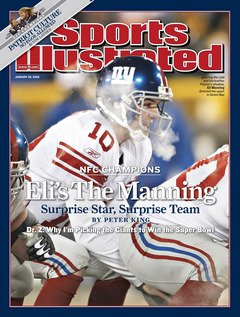 This entry was posted on January 23, 2008 at 2:18 am and is filed under Blezow, Cover Sports Illustrated, Favre, Manning, NY Giants, Patriots, SI Jinx, Sports Illustrated, Super Bowl. You can follow any responses to this entry through the RSS 2.0 feed. You can leave a response, or trackback from your own site.